Heel spur pain is one of the many common problems that we see today, which is caused by different reasons. Most people mistakenly think that they suffer from "heel spurs" when they feel heel pain. The truth is that rarely does a bone spur cause pain. Heel pain is commonly caused by plantar fasciitis though we have to keep in mind that not all heel pain is plantar fasciitis. The plantar fascia is a fibrous band acts as the support platform of the arch in our feet. It runs from our heel to the ball of our foot. When the alignment of the foot is poor, this tissue tends to strain and pull at the point where it attaches to our heel bone and causes micro-tears. With this occurrence, there is the formation of calcium deposits causing a growth like a nail. Since this growth is from the bone, it tends to find its way into the fleshy part of our foot. This is what causes the very painful condition and when injured, it makes it difficult for the plantar fascia to heal. 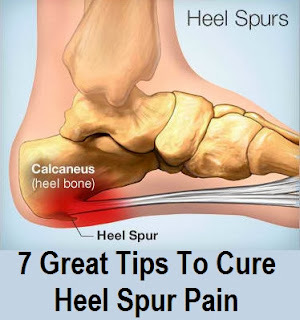 Heel spurs are the bony growth that is usually found below the heel bone or the calcaneous bone. The calcaneal bone is the biggest bone in our feet and it plays a major role in absorbing the pressure and shock when we move and walk. It is where you will feel the source of extreme heel pain when standing, walking or by a sudden movement like jumping. The pain can be excruciating when we place our full weight, or even just a bit of weight on our feet. 1. The severe pain that they feel in the heel or the arch as soon as they get out their bed in the mornings. 2. The worsening of the pain in the bottom part of the arch/heel as the hours pass by. 3. The pain that happens when you go from the sitting to standing during the day. Remember ladies and gentlemen, please do not ignore foot pain. It's not fun. Keep your head held up high because here's the fun part. 1. One of the most effective remedies for plantar fasciitis is using ice packs, which are a great help to decrease the inflammation. This has a numbing affect and will allow you to go about your routine during the day. 2. Another effective technique is to gently roll a frozen water bottle on foot making sure that the plantar fascia ligament is getting properly massaged. 3. A simple, and all too often ignored technique, is to give your foot as much rest as possible. Keep it elevated. It helps keep the pressure down. 4. I know this sounds a little counter-intuitive, but using a heating pad helps to increase the blood flow so that more of the healing agents the body produces will flow to the area. 5. Avoid walking barefoot. Wear a slipper or shoe around the house as your foot badly needs support especially if your floors are hardwood or built on concrete slab foundation, which is sure to aggravate the inflamed plantar fascia. 6. Worn-out shoes are a no-no for Plantar Fasciitis - many a time it is found to be the cause of this painful condition. 7. Just before going to bed at night make it a habit to slightly stretch your foot to and fro, helping the inflamed ligament to heal while you sleep through the night. 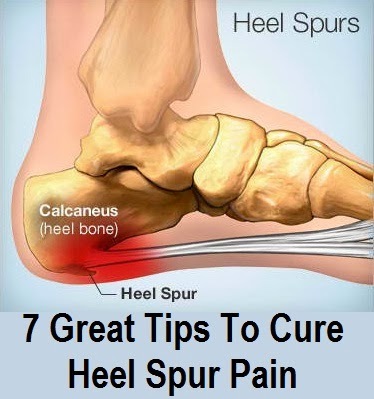 Curing heel spur pain is super easy to treat if you catch it during the early stages. But if you've had it for a while, then there's no time to waste. I know the pain can be excruciating, but, I sincerely suggest you Do Not rely on NSAIDs or anti-inflammatory drugs to relieve yourself of the pain.